Liverpool's Donovan Hunt (F2Tekkz) is the inaugural ePremier League Champion, having been crowned from 40 of the UK’s best gamers who took part in the inaugural 2019 tournament final. As the Xbox winner in the final, the world No 1 took on the PlayStation winner, Man Utd's Kyle Leese (KyleLeese_), winning 6-2 in the Grand Final, in London on 28-29 March and broadcast live on Sky Sports and the Premier League's digital channels. The inaugural ePremier League kicked off on 5 January 2019 for UK players of EA SPORTS FIFA 19 aged 16 or over only. Over the next three months, they competed across three rounds: online qualification, live Club playoffs and the eventual ePremier League Final. In online qualification in January, registered players took on each other to find the 16 best players on PlayStation 4 and the best 16 on Xbox One. These 32 players advanced to the Club playoffs. 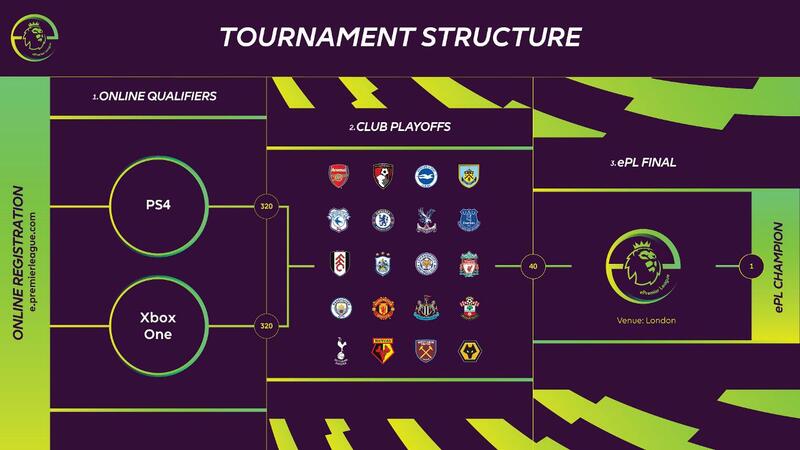 All 20 Premier League clubs hosted a live playoff round, giving two EA SPORTS FIFA 19 competitors, one for PlayStation and one for Xbox, the right to advance to the ePremier League Final. The 20 PlayStation and 20 Xbox players were split into four groups of five, from which the top two qualified for the knockout stages. The winner of the PlayStation category (Kyle Leese) then took on the Xbox winner (Donovan Hunt) in the cross-console Grand Final. Hunt, the World No 1 ranked EA SPORTS FIFA player on Xbox, won both legs to be crowned the inaugural ePremier League Champion for Liverpool. UK players registered online for the ePremier League from this date. Players competed against each other on their platforms in a cup format to determine the top 16 Club playoff finalists for PlayStation and top 16 for Xbox. The top 16 players for PlayStation and for Xbox faced each other in a half-day tournament to determine the club representative for each platform. The final took place in London, broadcast live on Sky Sports and Premier League digital channels. Matches were over two legs in a group-stage format for PlayStation and Xbox before knockout rounds determined a winner for each console. The two then met to determine an overall champion.